It does not matter what type of gutter system you choose, both the gutters and roofs need regular maintenance. If your home has open rain gutters, then they should be cleaned efficiently at least two times a year, especially in the spring season after the trees bloom and drop flowers, acorns, seed pods and during the fall season after the trees drop their leaves. You can request a free quote on gutter maintenance cost. A simple cleaning with a blower is all that is needed. Loose debris accumulates on the roof is certainly a fire hazard. 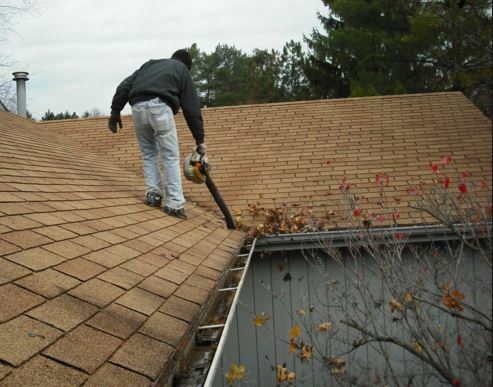 By cleaning out your gutters and brushing the debris from the roof is not an easy task. Climbing and moving ladders is dangerous. It requires strength and skills to maintain personal safety on a job, as well as climbing safety protection systems or devices. Our company has the right tools and safety equipment for doing gutter repairs. We can provide our clients with a complete gutter maintenance guide. If the climate gives an abundant rainfall, then you may want to have your downspout running into a dry well. This well can be a hole two to four feet wide and about four feet deep. Underground drainage pipes should lead to the dry well, and this will effectively keep water away from the home. Be sure to check local building codes before installing. Our company knows the local building codes for your area. You may inquire about the codes when we arrive to clean gutters. We offer our clients seasonalroof gutter maintenance services. You should contact us now and get a free consultation. We offer flexible and convenient appointments for gutter maintenance. Check the downspouts for rust, corrosion, flaking, chipping, or peeling paint,leaks can ensure you they are fixed tight against the fascia boards on the home. Checking the fascia boards for dry rotting or other climate damage or replacing them with treated wood or preservative can prevent problems. Our licensed company offerssheer-flow gutter filter installation services. You have come to the best company requesting gutter repair service. We have a team of expert gutter techs ready to serve you. We can arrive at your home or business to complete gutter inspections, measurements, repairs, replacement, new installment and more. We offer the best affordable prices, warranties, customer service, advice and tips. You can expect the best and highest quality gutter system products from us. We are committed to helping our clients have the most durable gutters with lowest maintenance. You may contact us a few different ways, by filling out the short form, by sending an email, or giving us a call. We love to chat with new clients and keep them updated on our new gutter products and services. Once you have received our services, then you should submit an online review to help other decide if they need gutter maintenance services too. We respect client privacy by never sharing info with other companies. ​Providing regular maintenance checks or inspecting your gutter system can help you prevent and avoid many problems. Gutters are essential to the home in diverting rain water away from the roof, walls, and foundation of the home. We are a licensed and insured gutter company offering our services in your area and surrounding cities. If you have been looking for gutter repair service, then you have come to the best place. We can give you a free quote on gutter maintenance costs. You may contact our gutter company by filling out the short form on our site or just give us a call. We have an expert team of techs that have been extensively trained in the gutter repair and replacement field. Our company can supply client with a gutter maintenance guide to help them know when their gutters need servicing. Roof gutter maintenance is just as important as the downspout maintenance. Oursheer flow gutter filter installation and regular gutter maintenance services come at a great low price and all repair service are guaranteed.